Launched in the UK in January 2007, Belotero® is a new monophasic double crosslinked hyaluronic acid created in Switzerland by Anteis, and distributed in the UK by Merz Pharma UK Ltd.
Non-Animal Hyaluronic Acid (NaHA) gel. Belotero® has been designed from biofermentation hyaluronic acid, a substance naturally present in our body; which the makers claim makes it safe and completely biocompatible, as well as wholly biodegradable. It is created using Cohesive Polydensified Matrix (CPM) technology, a unique process which gives Belotero® hylauronic acid unusual elasticity; (this technolology adds to its “mono-phasic” nature). Belotero® therefore guarantees a considerably better result from the first hours after the injection and over the initial months, in terms of increased volume and wrinkle filling compared to “biphasic” products. Belotero® is prepared from non-animal, hyaluronic acid NaHA by a patented dynamic reticulation process. The unique polydensified cohesive structure of Belotero® consists of a cohesive gel which is easy to inject through a small diameter needle. Medical device. Also approved by the US Food & Drug Administration in 2011. 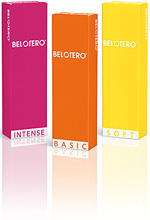 Belotero® has three main different formulations within it`s range: Balance (previously Basic), Soft and Intense. Belotero® Balance (22.5mg/ml of NaHA) is an ideal product for volume enhancement treatments and can be used for deep furrows, lip augmentation, facial outlines, naso-labial furrows, glabellar lines and the correction of facial depressions, either due to injury or age-related scaring. It is injected into the medium to deep dermis with a 27G needle. Belotero® Soft (20mg/ml of NaHA) is an ideal substance for superficial wrinkles and can be used for perioral wrinkles, lip commissures, crow`s feet, and forehead wrinkles. It is injected into the upper dermis with a 30G needle. Belotero Intense (25.5mg/ml of NaHA) is an ideal product for deeper lines and wrinkles. It is injected into the deep dermis with a 27G needle. Since 2014 the range has also become available with the addition of lidocaine (local anaesthetic) for added patient comfort. This is known by the name Belotero + and is available for all three products within the range. The manufacturers claim that Belotero® is long lasting and effective from 6 to 9+ months and suggest that two treatments per year are sufficient for an elegant, natural result. Transient erythema (redness), swelling, pain, itching, discoloration or tenderness at the implant site. Typically resolution is spontaneous, within one or two days after injection into the skin, and within a week after injection into the lips. The manufacturers state that there is no risk of granulomas and no risk of ‘lump effect’ – although the product may be too new to identify these rare reactions which can occur with other hyaluronic acid fillers. This depends on the area treated and how much is required, and the practitioner doing the treatment, but price ranges are in the region of £200 -£300 per treatment. Fuctionality Study: Dr Bezzola - Switzerland, Dr Luiggi - France, Dr Micheels - Switzerland, Dr Reynaud - France. The safety of the product: no immediate, short or mid term side effects have been mentioned, except some redness that disappear few hours after the treatment. The optimized ease of use of the product , thanks to the ergonomy of the syringe and the behavior of the product under the skin, comparing to competitive products. The very nice aesthetic result that Belotero® procures immediately and within the first month. After having proved the safety of the product for the patient during this functionality study, Anteis has planned to complete the first results concerning short term performance and to launch a long term evaluation of the product. Clinical results of male nasolabial lines treated with Belotero®. Images courtesy of Dr. Patrick Micheels, Switzerland, Geneva. Female, décolletage (area between next and breasts) before treatment and 6 weeks post treatment with Belotero®. Images above provided courtesy of Dr.Geoff Fairris, Dermatologist at the Wessex Skin Clinic. Female, nasolabial (nose to mouth) lines before treatment and immediately post treatment with Belotero®. Images above provided courtesy of BotoMedics Ltd.
Click for ALL Belotero ® clinics in the UK & Ireland registered and verified by Consulting Room.